First released in 1976, The Little Girl Who Lives Down The Lane tells the story of Ryann Jacobs (played by Jodie Foster, who was thirteen years old when she made this film). Rynn lives in a small New England town, in a house that her father has leased for three years. It’s been a while since anyone has seen Rynn’s father. Rynn always tells everyone that he’s either out of town or that he’s busy in his study and can’t be disturbed. When the friendly local policeman (Mort Schuman) expresses some doubt about Rynn’s claim that her father is working, Rynn says that her father is a drug addict, like all of the great poets. Rynn’s main problem is with the Halletts. Cora Hallett (Alexis Smith) owns the house in which Rynn is living. Cora drops by regularly, haughtily demanding to see Rynn’s father. Her creepy son, Frank (Martin Sheen), also makes a habit of visiting. He’s not interested in Cora’s father. Instead, he’s interested in Cora. Everyone in the town knows that Frank is a perv but no one is willing to do anything about it. He’s protected by his mother’s money. One day, when Cora drops by, she insists on going into the basement. She says she has something down there that she needs to retrieve. Rynn tells her not to go down there but Cora refuses to listen, which turns out to be a huge mistake. Cora screams at what she sees down there and then falls to her death. With the help of her only friend, Mario (Scott Jacoby) an aspiring magician who walks with a limp, Rynn covers up the murder. Mario turns out to be a very good friend, indeed. Not only does he tell people that he’s seen Rynn’s father but he even stands up to Frank when he shows up at the house, searching for his mother. However, as it soon becomes clear, Frank isn’t one to give up so easily…. 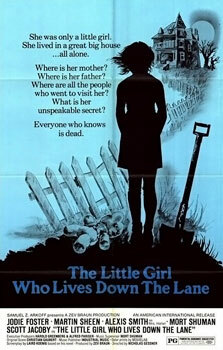 The Little Girl Who Lives Down The Lane is an interesting hybrid of a film. It definitely does have elements of horror. The running theme throughout the film is that Rynn might kill people but it’s all the adults in her life who are truly monstrous. Frank is truly a monster and Martin Sheen gives a remarkably intense and creepy performance in the role. Frank is the type who will say that worst things imaginable and then smirk afterward, confident that he’ll never have to face any sort of justice for his crimes. At the same time, the film is also a coming-of-age-story and a teen romance. Rynn and Mario are two outsiders who find each other. You like both of them and you want things to work out for them, even though you spend almost the entire film worried that Rynn might end up poisoning Mario. Foster and Jacoby share some genuinely sweet scenes. Things would be just fine, the film seems to be saying, if all of these stupid adults would just mind their own business. The Little Girl Who Lives Down The Lane is an effectively creepy and sometimes even sweet little film about a girl who occasionally has to kill people. Keep an eye out for it!